The Roaring Twenties, from 1939, is watching the tail end of an era of genre films that had run its course, and was pretty hollowed out. Many film historians try to pump this film up as a great film, but it’s utterly absurd, and the claim founders upon the film’s story. It was adapted from a fact-based story by crime reporter Mark Hellinger, The World Moves On, but Jerry Wald, Richard Macaulay and Robert Rossen’s screenplay is larded with clichés, poor dialogue, and almost every predictable plot device of the genre. Even the soundtrack, by Ray Heindorf and Heinz Roemheld, is utterly pedestrian. The cinematography, by Ernest Haller, is also nothing spectacular, and the reuse of footage from earlier Warner Brothers gangster films (such as The Public Enemy), in montages, does not add anything to this film. In fact, the only things that are really any good in this 104 minute long film are the performances of, surprise, surprise, James Cagney and Humphrey Bogart. Cagney plays Eddie Bartlett, a reluctant New York gangster, drawn into bootlegging after he could not find honest work after returning from World War One. Bogart plays his Army buddy, George Hally, who is a sadist and creep. They represent two archetypal bad guys: Cagney as the equivocal one, and Bogart as the evil one. The third member of this war veteran group is Lloyd Hart (Jeffrey Lynn), who is the Good Man of the film, who ends up with the girl Bartlett loves, Jean Sherman (Priscilla Lane). After hooking up with a bootlegging barfly named Panama Smith (Gladys George), who clearly loves him, Bartlett obsesses on Jean, even as Hally, now a business associate, warns him of her feelings for Hart, the only ‘college boy’ of the three. As Hally feels more marginalized, he conspires with a criminal competitor of theirs to kill Bartlett, after Bartlett’s old pal, Danny Green (Frank McHugh) is delivered dead to Bartlett’s night club door. Bartlett survives, but breaks with Hally, whom he suspects of a doublecross. Panama goes with Eddie, who loses everything in the Stock Market Crash. Meanwhile, Hally and Hart are on a collision course, as Hally becomes the city’s top crime boss and Hart becomes a powerful Assistant District Attorney, with a four year old son with Jean. Hart intends to use his inside information on Hally to bust him, and this makes Hally send over a goon squad to threaten Jean. She turns to Bartlett to get Hally off Hart’s back, and after initial reluctance, the broken Bartlett goes to speak to Hally. He makes a plea, but Hally isn’t listening. He feels if he kills Hart he’s doing Bartlett a favor by making an opening for him with Jean. Bartlett is about to give up when Hally makes an error. He feels that Bartlett will go to the cops to save Hart, so tells him that he’s going to have to take him for a ride. Bartlett overpowers Hally’s thug, and shoots Hally dead (the third and final time Cagney’s characters would kill Bogart’s in their films together- the first two being Angels With Dirty Faces and The Oklahoma Kid), offended that Hally would think he would do such a thing as squeal to the cops. As he tries to escape, Bartlett takes out several of Hally’s men, but is shot in the back as he flees up the steps of a church, then falls down. Panama holds his dead body, as a cop asks who he was. Panama replies that he used to be a big shot. It may come to pass that, at some distant date, we will be confronted with another period similar to the one depicted in this photoplay. If that happens, I pray that the events, as dramatized here, will be remembered. In this film, the characters are composites of people I knew, and the situations are those that actually occurred. Bitter or sweet, most memories become precious as the years move on. This film is a memory- and I am grateful for it. In short, there is no pretense that this film serves any higher purpose. One of the better aspects of the film, however, is the Bartlett character. He is a crook and killer, but one with his own set of ethics. He seeks to save Hart, at film’s end, not for Hart- his war buddy, but for Jean, whom he still loves. But he has no intention of pushing Hally to relent, after he denies Bartlett’s request. The only reason Bartlett kills Hally is his being offended that Hally thought he’d turn squealer. And, this is not an unjustifiable thing. After all, Hart is living the high life not on the salary of an ADA, but from his illegal earnings when he was working for Bartlett, so the conventional idea of the three main male characters as one evil, one good, and one gray, is not really true. And, as in all his films, Cagney shows he was not only a great actor, but a criminally underrated one, as well. Just look at the scene, before Bartlett goes to Hally’s. He leaves a bar with Panama, turns back to a piano player, then listens briefly to a tune and glares off into the void. Perhaps he is pondering the beginning of his end, perhaps he is wondering about what his life would have been like had he not let Jean go. Nonetheless, it’s a deeper touch than the pedestrian script allows, and one I’d bet was an improvisation from Cagney, which lifts the film up from mere hammy melodrama. The Warner Brothers DVD is very good, a better overall package, in fact, than the film alone. The film’s visual quality is quite good, given its age. The whole film is in a 1.33:1 aspect ratio, and the DVD is part of a 6-disk Warner Brothers Gangsters Collection. The film runs 104 minutes. The extra features are all good, as well, for the DVD tries to present the film as it would have been shown in theaters, in a section called Warner Night At The Movies. Hosted by film critic Leonard Maltin, the segment features cartoons, newsreels, trailers and short subject films from the same year as the film in the DVD- this one being 1939. The trailer is for Each Dawn I Die, a gangster flick with Cagney and George Raft. Then we see a newsreel and a comedy short- The Great Library Misery, a cartoon- Thugs With Dirty Mugs, a musical short- All Girl Revue, and other trailers. The featurette on the film is the best extra, called The Roaring Twenties: The World Moves On. Assorted film experts, including director Martin Scorsese, reminisce on the film and its impact. The film commentary features film historian Lincoln, and it’s a generallty good commentary, although Hurst claims the film is ‘great,’ when it’s clearly a lesser example of the gangster genre film. However, he does move the commentary along, never bogging down in minutia, and actually the last two thirds of the commentary seem to have Hurst hitting his stride, as it seems he needed to find his rhythm in the piece. Still, The Roaring Twenties is definitely the weakest of the films offered in Warner Brothers’ DVD six-pack, although, despite its flaws it is still enjoyable. 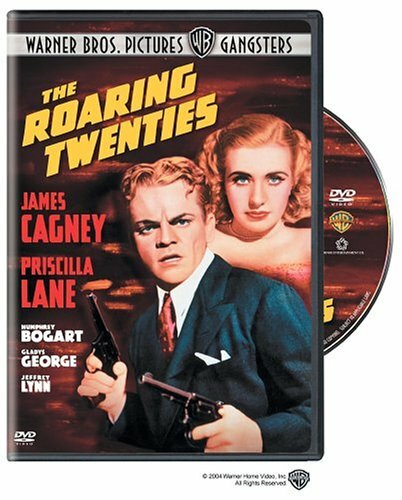 The Roaring Twenties is not a great film, and not even close, but it does have another very good, if not great, performance by Cagney (see his slow turn from teetotaling milk drinker to alcoholic by film’s end). If there is one thing that DVDs can do well, it is to help to reintroduce great artists from film’s past to new generations. And, at the top of that list, at least for Americans, is Jimmy Cagney. He simply made all actors who worked with him better, and made all the films he was in better (in much the same way Vincent Price always lifted schlock horror to something palatable). No further proof is needed than to see how a mediocre script can still turn out nuggets of gold in Cagney’s hands. That, dear readers, is what they call being a star. And it’s been to long since a real one was around these parts, eh?